United States Army Service Plane, special flight Cristobal to Port Limon, special green circular dispatch cds "AS Plane #41", violet circular San Jose 29/12 receiver on front, Roessler corner cover. 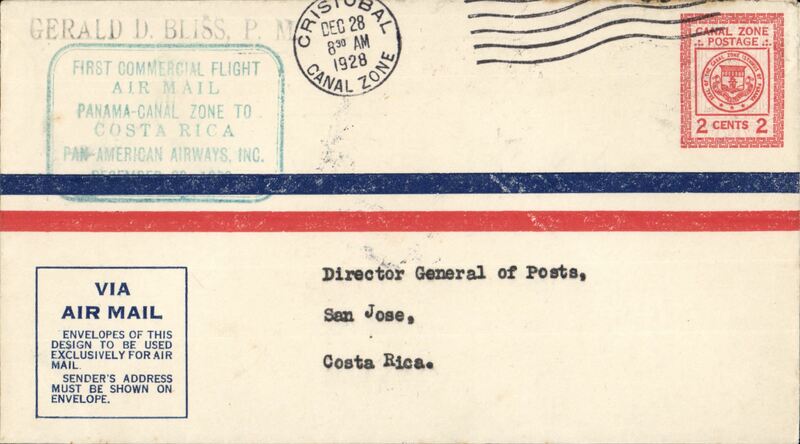 F/F Canal Zone to Costa Rica, b/s "San Jose ENE 14 1929, type A 2c PSE, Cristobal/Canal Zone/Dec 28 1928 machine cancel, large green bounded special cachet prepared by the Cristobal PO "First Commercial Flight/Air Mail/Panama-Canal Zone to/Costa Rica/Pan American Airways Inc/December 28, 1928". Just above the cachet is a "Gerald Bliss P.M." hs. The flight was arranged at short notice; there was no prearranged airmail fee, and mails were sent at the prevailing domestic first class letter rate. A copy of a four page extract from an article by Richard Saundry giving a detailed examination of this particular flight which appeared in the Airmail History of Costa Rica, 1999, p48-51 accompanies this item. 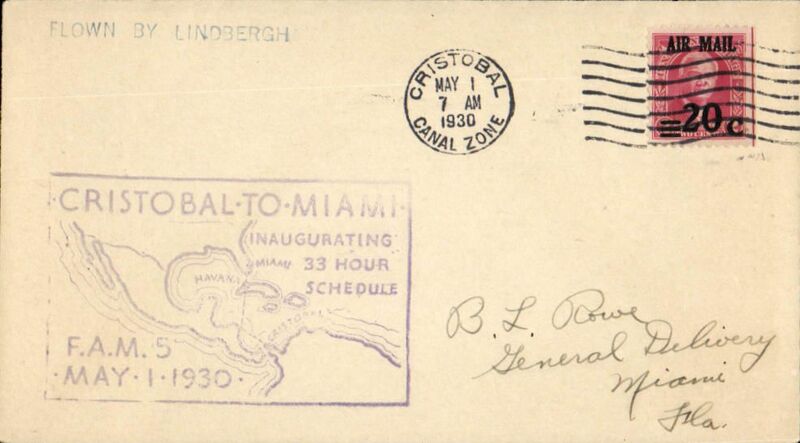 F/F FAM 5 Cristobal to Miami, cachet, bs 13/2, airmail cover, flown by Lindbergh, Pan Am. Carried by Sikorsky S-38A amphibian. 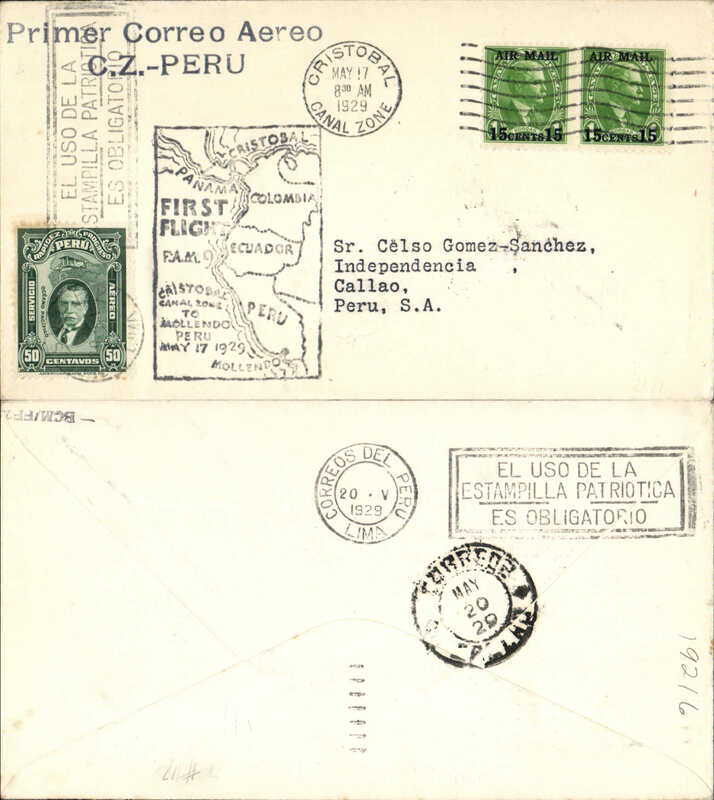 PANAGRA, F/F Cristobal to Lima, bs 20/5, and on to Callao 20/5 by rail, plain cover franked 30c CZ stamps and 50c Peru stamp tied by Lima slogan cancel as receiver, black 'Primer Correo Aereo/C.Z.-Peru' hs, and large black framed 'map' flight cachet. 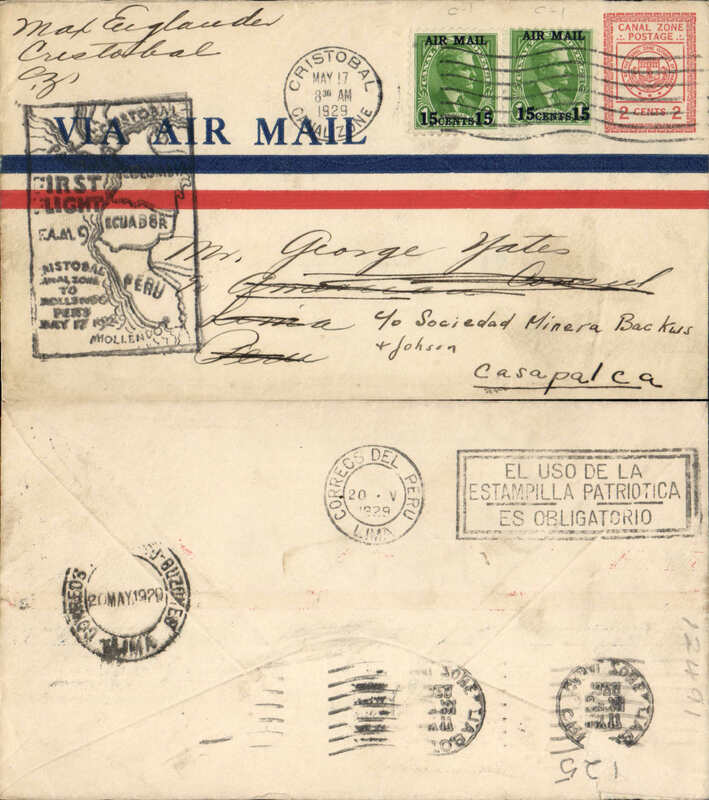 PANAGRA F/F Cristobal to Guayaquil (Ecuador), bs17/5, plain cover franked 15c, large black framed 'map' flight cachet. Also B&W photoscan, 45x145mm, of Sikorsky S38 seaplane which flew this leg of the route. 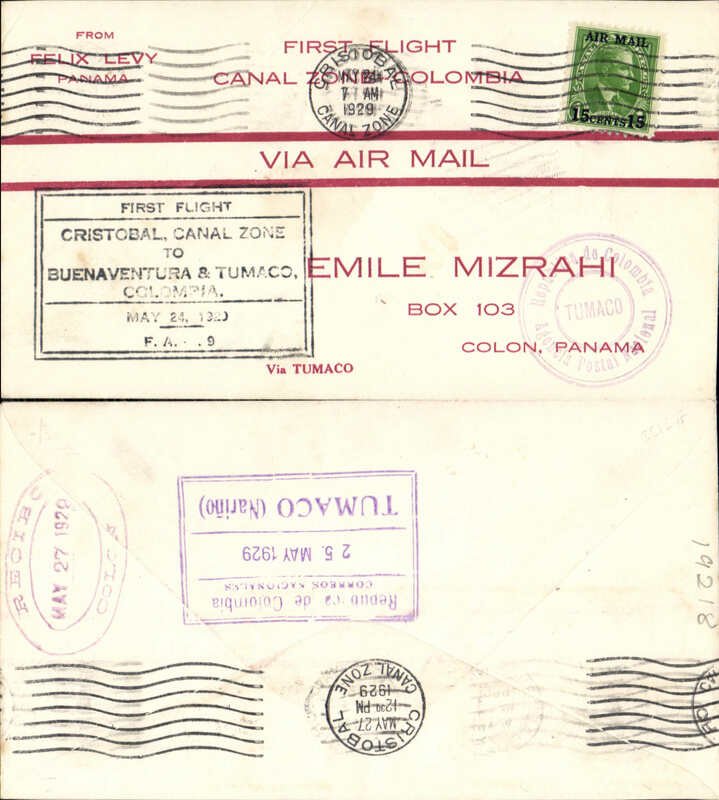 PANAGRA F/F Cristobal to Tumaco (Colombia), bs 25/5, and return to Canal Zone, bs's Cristobal and Colon 27/5, red/cream 'First Flight/Canal Zone to Colombia' souvenir cover, franked 15c, large black framed flight cachet. Carried by Sikorsky S38 seaplane. 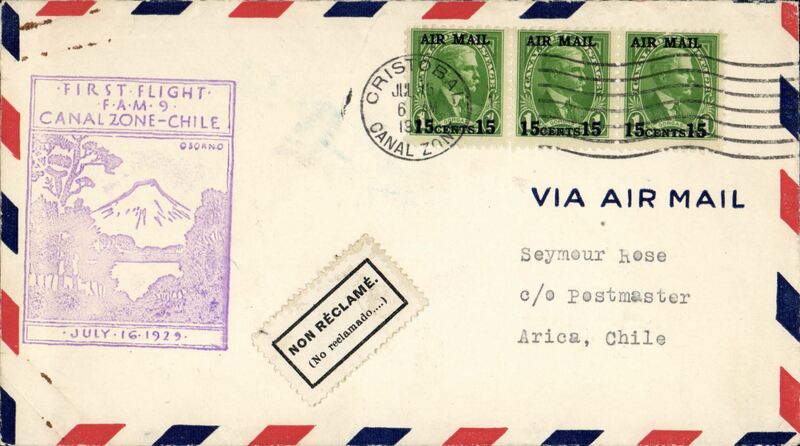 PANAGRA/Linea Aeropostal Santiago , F/F FAM 9, Cristobal to Arica (Chile) b/s 19/7, and on to Iquique, bs 21/7, large purple framed flight cachet. Chile did not grant cabotage rights to Panagra, so flown form Arica to Iquique by Linea Aeropostal Santiago. Interesting. F/F FAM 9, Cristobal to Arica (Chile) b/s 19/7, large violet cachet, Pan American Grace Airlines. 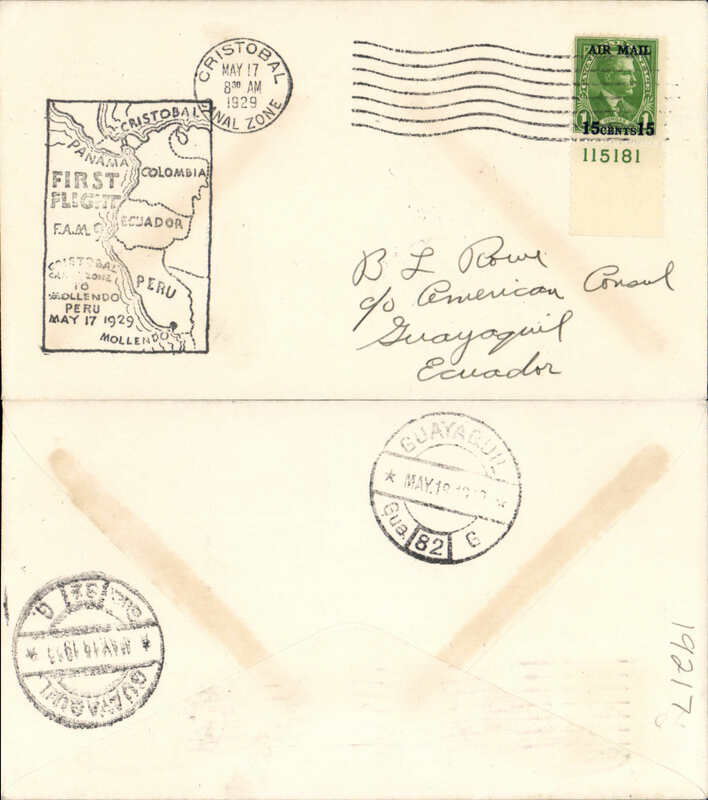 F/F FAM 9, Cristobal to Buenos Aires, franked 52c, violet rectangular flight cachet, bs 14/10, Pan American-Grace Airways. Carried by Sikorsky S-38A amphibian to Guayaquil, then Ford trimotor landplanes across the Andes to BA. 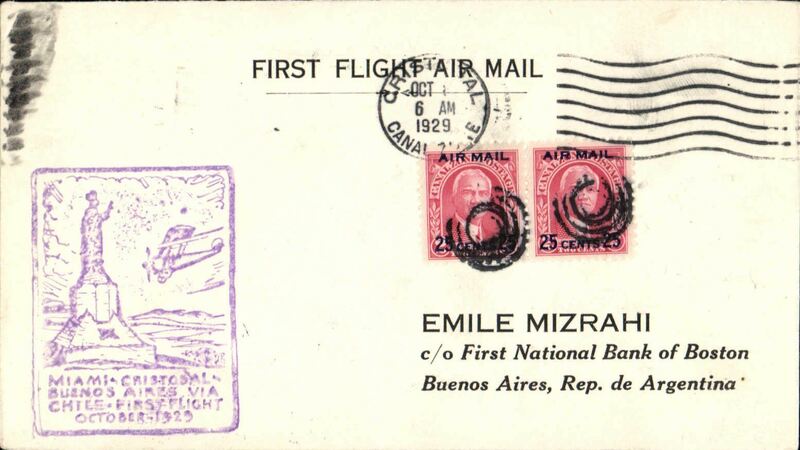 PANAGRA F/F Cristobal to Buenos Aires, bs 14/10, black/white Mizrah ,Primer Correo Aereo' cover franked 50 c, violet framed flight cachet. Lindbergh flown, FAM 5 Express airmail service, Cristobal to Miami, bs 2/5, large violet framed "33 Hour Schedule" cachet, Pan Am. Carried by Sikorsky S-38A amphibian. 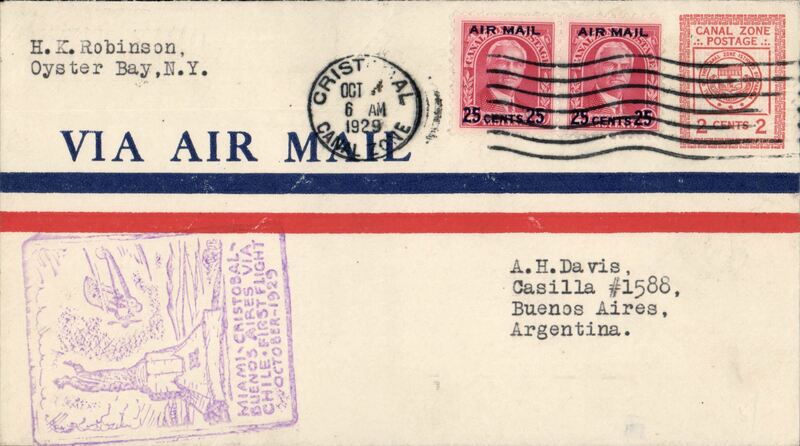 F/F FAM 5, Cristobal-Maracaibo (Venezuela), cachet, b/s, Pan American Airways corner cover, 10x20cm, franked 15c, canc Cristobal cds, green framed flight cachet, Pan Am. Carried by Sikorsky S-38A amphibian. 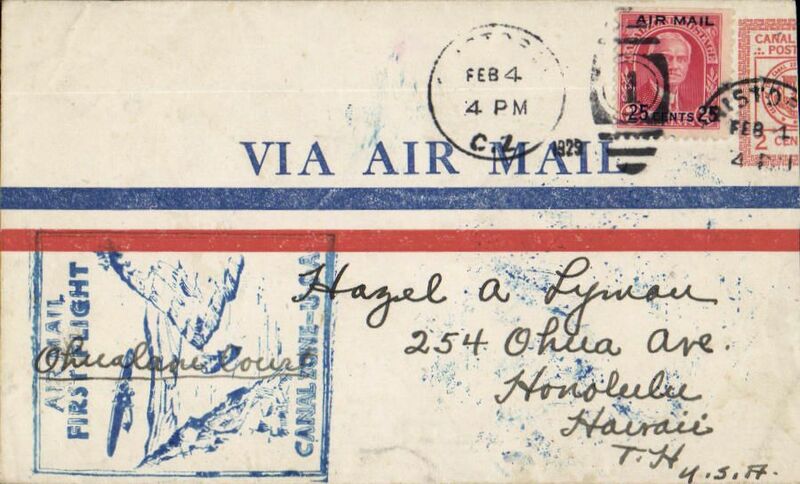 F/F FAM 5, "Completing The Lindbergh Circle", Cristobal to Port of Spain, Trinidad, and on to California bs 24/2, plain cover 10x24cm with large uncommon air mail label, official framed purple cachet used on Cristobal mail and Miami transit mail to Port of Spain. Pan Am. 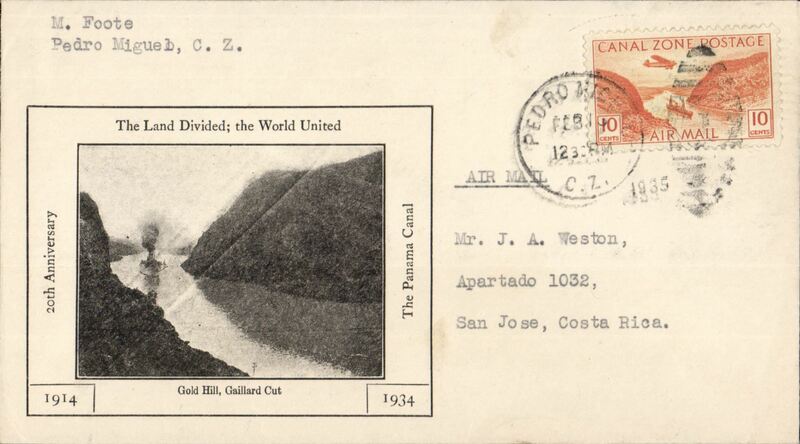 Pedro Migueb, CZ, to San Jose, CR, bs 16/2, 20th Anniversary opening of Panama Canal, souvenir cover with B&W picture of Canal, franked 10c, typed 'Air Mail'. Uncomon origin and cover. 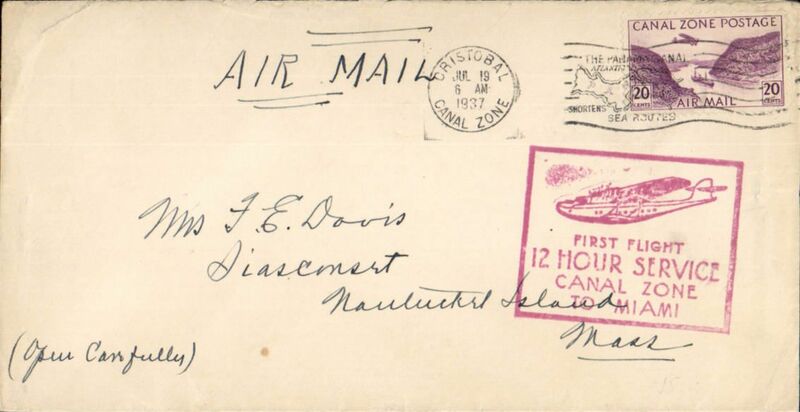 F/F Expess service to Miami, boxed red "First Flight/12 Hour Service/Canal Zone/To Miami", franked 20c, canc Cristobal Jul 19 1937 cds. Pan Am. Carried by Sikorsky S-42A flying boat. 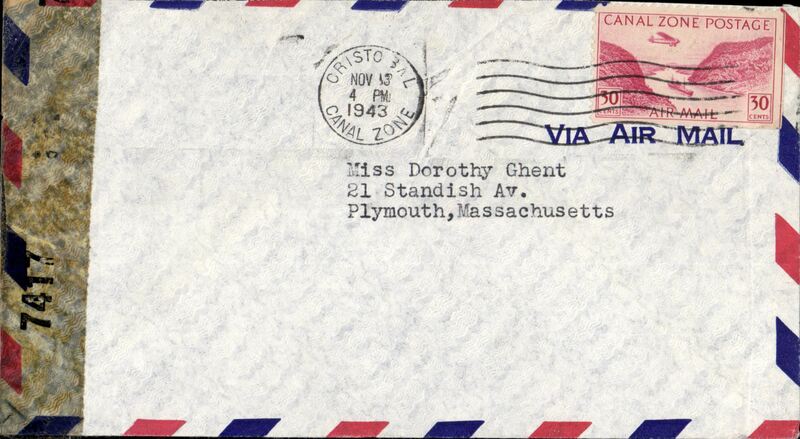 Censored airmail cover, Cristobal to Plymouth, Mass, franked 30c, sealed US 'Examined By' censor 7417 (New York). 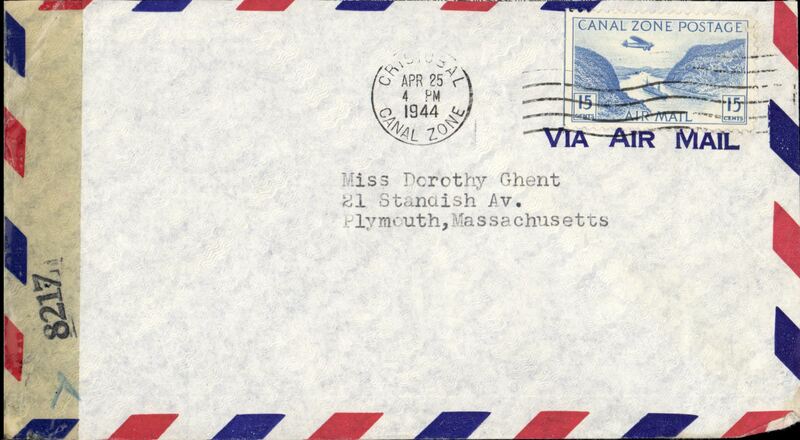 Censored airmail Cristobal to Plymouth, Mass, franked 15c, sealed EB 8217 (New York) censor tape. Uncommon.